The words “luxury” and “vinyl tile” didn’t used to go together, but now they truly can. Products such as Congoleum DuraCeramic, Armstrong Alterna, and Mannington Adura allow homeowners to put in upgraded products that look and feel like ceramic without all the cost or the hardness. And, these next generation vinyl tiles can be grouted with a caulk grout (which is stain proof) to give them a terrific ceramic tile look ~ with much easier maintenance. Designed to mirror natural stone, they are a fantastic option for people who want a more realistic look. Today’s vinyl floor coverings are stain and tear resistant, highly water resistant and are all easy to clean no-wax surfaces. Additionally, the colors and styles range from the classic to the contemporary, and all have patterns built in to help keep everyday dust and dirt from being such an eyesore. 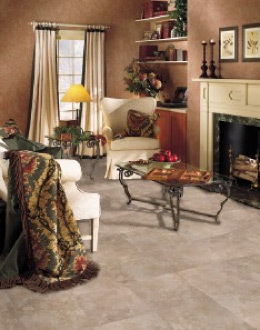 Warmer and less expensive than ceramic tile, vinyl is a great solution for active families. Interested in the functionality and look of a vinyl floor? Our design consultants can bring samples to your home and show you how they’d look in your kitchen, entry or bath during a no obligation shop-at-home appointment. Call or click today to set up your free appointment. Do you want more technical information about vinyl products? Our “Vinyl 101” will give you everything you need to make an informed decision.